Rolling terrain, variations in elevation, changes in land use (toward middle at top of image) and density of hardwood forest are features in this aerial photograph. The evenness of the edges of the areas of heavy forestation toward the top of the highway indicate that part of the forest was cleared by man and the cleared area has little vegetation. The city of Galena can be seen at top right. The tiered limestone steps at the bottom of the image lead to the park's information center (partly obscured by trees) in the middle-third at the bottom of the image. Notice the shadow of the blimp that lifted the camera. It is in the trees toward the bottom mid-section of the image (see arrow). When viewing the image at full-size or by zooming in on the image one can see smoke or steam emitting from a structure in the distance (see arrow) indicating land-use by industry can also be documented through aerial photography. This structure emitting smoke could be from the coal-fired generation plant at Riverton and if so, Empire Lake would be the area over to the left of the structure. As mentioned in the introduction, several methods were used to conduct research regarding the general geomorphic conditions and geologic setting of the Ozark Plateau. The primary method was through collection of photographs at Schermerhorn Park using small-format aerial photography, specifically with a 13-foot helium blimp. 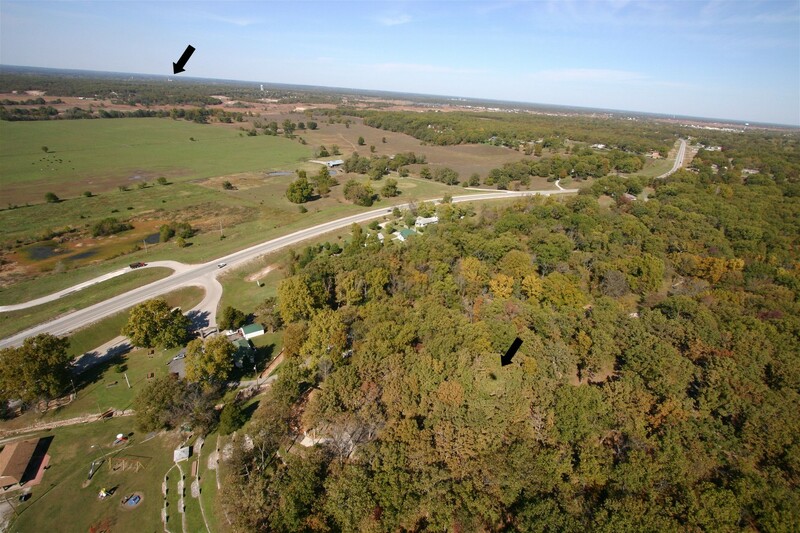 Due to calm to light wind, the blimp photography was chosen over kite photography for our class trip to Ozark Plateau. The blue tarp was laid out for inflating and deflating the blimp. Our group inflated the blimp from a helium tank. Four tail fins steadied the blimp during flight, and several points along the bottom allowed attachment of the tether line and camera rig. The remote-controlled camera rig was the same as the one we used in the earlier field trip for kite aerial photography, and the blimp lifted both cameras, individually, with ease. 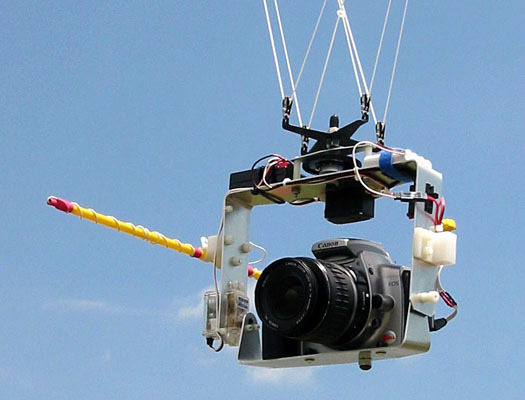 The aerial photography system also includes a hip harness for attaching the reel and line and a Picavet suspension system, that is a cable and pulley, to attach the camera rig. 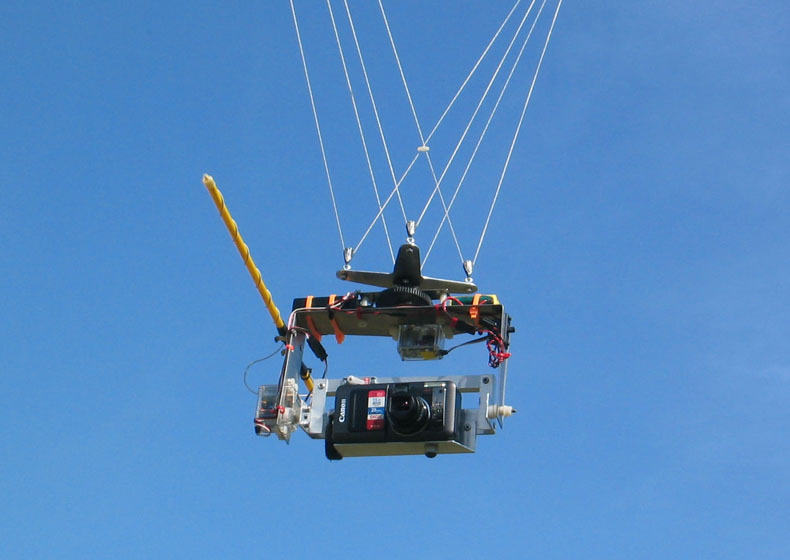 The photography process requires three people, the kite flyer, a camera spotter, and a person to operate the radio controls that moves the camera and takes pictures. When the flyer and spotter are separated they communicate by radio. The spotter instructs the flyer when to move the camera position and when to take each photo. The state of Kansas has a climate typical of the continental interior North America with hot summers and cold winters. Weather is influenced by the steep temperature gradient between the Rocky Mountains to the west and the Gulf of Mexico to the south. Elevation changes are gradual but influence climate regionally. Heavy rains occur more often in the Ozark Plateau area of Kansas in September, with possible precipitation of 12.7 to 25.4 centimeters (5 to 10 inches) in a 24-hour period. Floods may occur throughout the year in southeastern Kansas, but the period of greatest flood frequency is spring and summer, during times of prolonged or torrential rain. This region averages more than 101 centimeters (40 inches) of precipitation a year, making it one of the wettest areas of the state.